“Access to Justice Warrior” Gary Slovin, second from right, was surprised to receive three commendations at the 2018 Access to Justice Conference. From left, Chief Justice Mark E. Recktenwald, Associate Justice Simeon Acoba, Jr. (ret. 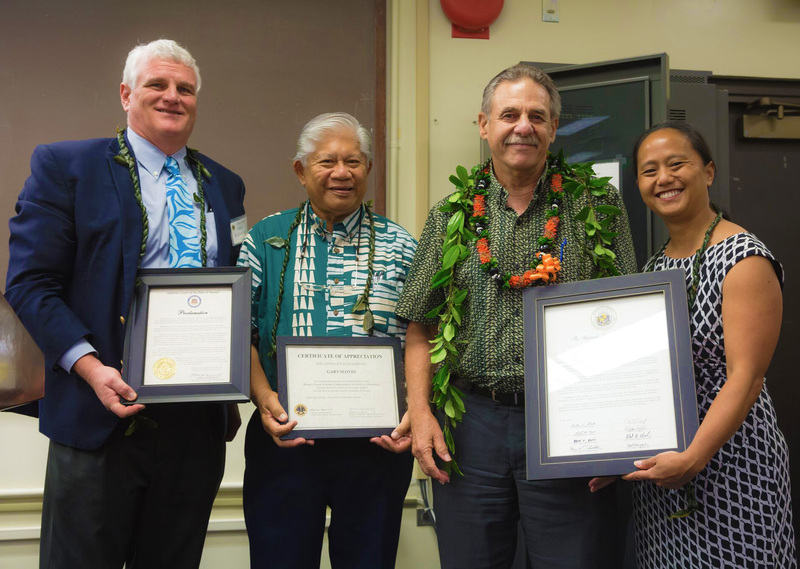 ), and House Majority Leader Rep. Della Au Belatti recognized Slovin for his many years of dedicated service to improve access to justice for those in need. The fighting spirit embodied by the 300-plus participants at the 2018 Hawaii Access to Justice Conference gave hope and renewed energy to continue advocating on behalf of those who might feel like they have no voice in the legal justice system. “Fighting for Access to Justice for All” was the theme of this year’s conference, held at the William S. Richardson School of Law at the University of Hawaii at Mānoa. It was sponsored by the Hawaii Access to Justice Commission with support from the Hawaii Justice Foundation. The day opened with warm welcoming remarks from Dean Avi Soifer of the Law School, Associate Justice Simeon R. Acoba, Jr. (ret. ), who chairs the Hawaii Access to Justice Commission, and Chief Justice Mark E. Recktenwald. All three noted that while much progress has been made, there is so much more that needs to be done. “Remember, we’re only as good as the next person who walks into a courthouse, who is scared, and is seeking justice,” said Chief Justice Recktenwald. One person who has been a tireless and fearless leader in the never-ending quest to improve access to justice is Gary Slovin, who was recognized with three certificates of commendation for his passionate advocacy over the years. House Majority Leader Rep. Della Au Belatti dubbed Slovin an “Access to Justice Warrior” and praised him for his deep and abiding sense of compassion and service to those in need. Justice Acoba and Chief Justice Recktenwald shared stories about how Slovin continually works to get funding for organizations and programs benefitting the less fortunate who are confronted with civil legal challenges. Keynote speaker Chief Judge Robert A. Katzmann of the United States Second Circuit Court of Appeals gave a spirited talk about ensuring adequate legal representation for immigrants, which is essential to the administration of justice. He noted that everyone in the room could identify with the plight of immigrants as “we are honoring our immigrant heritage.” During his talk on “Access to Justice for Low-Income Immigrants,” he described several projects he helped launch that are designed to help people who otherwise cannot receive adequate representation. The conference also featured concurrent workshops covering a wide range of topics related to civil access to justice. There were panel discussions on incubating innovation through technology (the Microsoft legal access platform); priorities in the state budget for the low-income Hawai‘i residents; issues involving affordable housing, immigrants, and workers’ rights; sexual harassment; civil access for those in prisons; revival of the Hawaiian language; collaborations and innovation; and technology in mediation. The conference concluded with reflections on the state of access to justice by several speakers.